As I’m sure you know and will no doubt be reminded 1,908 times, this is a match-up of “cursed” teams. The Cubs, obviously, haven’t won a World Series since 1908 and hadn’t even been to one before this year since 1945, when a goat was infamously refused admission to Wrigley Field, leading to the infamous “Curse of the Billy Goat”. Cleveland, meanwhile, hasn’t won a World Series since 1948, and is said to have been cursed to never do so again because of the trading of popular star Rocky Colavito in 1960. Others, however, say that the curse is actually the “Curse of Wahoo”, which fates the Indians to runner-up status until they remove the unquestionably politically-incorrect red-faced smile from their uniforms entirely (the Indians have made it much less prominent recently, but it’s still there). Unless you count the three different Washington baseball franchises as one line of tradition (and most don’t), these are the two most snake-bitten teams in basically all of North American sports. One of them has to break a curse here, right? Or are we doomed for an endless series where the extra innings spread on until Baseball Armageddon? It’s hard to put into words how great Andrew Miller has been lately, and how well Terry Francona has used him. Ignoring the outdated orthodoxy that caused even the relatively-maverick Buck Showalter to hold Zack Britton for a save opportunity that never came, Francona deploys his best pitcher when he’s most needed. And for that reason, it is going to be imperative that the Cubs score early and probably often. Because Miller Time probably means another year without a World Series title if they don’t. I’m looking forward to seeing Kyle Schwarber, making his first appearance since getting injured all the way back in April. He’ll only be DHing and perhaps pinch-hitting, but with his bat, that could easily mean we might see a Kirk Gibson moment where a player who has no business being in the game delivers a magical moment. Or maybe he’ll be a total non-factor who strikes out. Where’s the fun in that, though? Amazingly, the fact that Theo Epstein’s team is facing Terry Francona’s team hasn’t gotten as much play as I thought it would. I mean, it’s been brought up a lot, but not as much as I thought it would have. Probably because of the bigger storylines going around. Should the 1919 “Black Sox” really have been the favorites in the 1919 World Series? There are some assumptions of baseball history that are almost accepted wisdom. For example, it’s treated as a near-given that Ted Williams, had he not lost so many years to the military, would have finished his career as statistically the greatest hitter who ever lived. It’s almost assumed that the Montreal Expos would have won the World Series in 1994 if not for the strike. 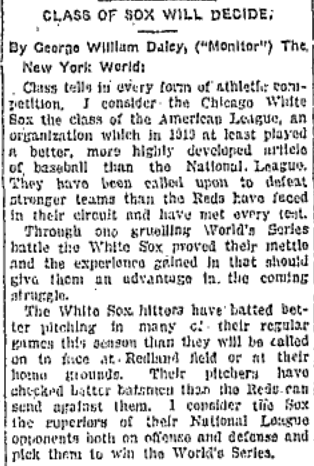 And then there is the thought that the 1919 Chicago White Sox would have run roughshod on the Cincinnati Reds in the 1919 World Series if not for the conspiracy to throw the series. Heck, in the Eight Men Out movie, a Reds player compares his team to Custer about to make a final and suicidal last stand. But were they? 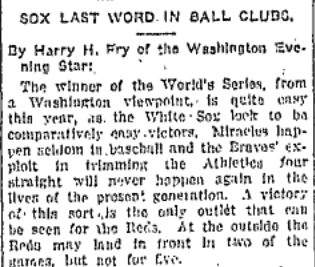 Game-throwing or not, was the triumph of the 1919 Reds really that big of an upset? 1. The 1919 Reds were 94-66, one of the best records in baseball history. Obviously, to get to the World Series, especially back in the days before multiple rounds of playoffs, a team’s record needs to be good. But the 1919 Reds had a record that was great. Their .686 winning percentage was the highest for Cincinnati in the 20th century, and only .002 behind the 1882 American Association title-winning Cincinnati Red Stockings. That means that, yes, in winning percentage, the 1919 Reds were better than the 1975 Big Red Machine that went 108-54 (.667 winning percentage). It was the second-best winning percentage of the 1910s (behind only the 1912 Red Sox, who went 105-47 for a .691 winning percentage) and no team would have a winning percentage higher than it again until the 1927 Yankees. It remains the 18th best winning percentage since 1901. Three of baseball’s greatest franchises (Dodgers, Tigers, Browns/Orioles) have never put together a season with that good of a record despite having a combined total of over three centuries to try. Oh, and by the way, the 1919 White Sox went 88-52 for a .629 winning percentage. Not too shabby, but hardly one for the record books. 2. The Reds finished the season hot as hell. In the second half of the season, the Reds were an astounding 47-19, a .712 winning percentage. By comparison, the White Sox had their second half of games end with a record of 41-27, a .612 winning percentage. This is all the more remarkable when you consider that for the last month or so of the season the Reds had little to play for, as they blasted away second-place New York by nine games. The White Sox had three eventual Hall of Famers on their roster, but only two of them (Ray Schalk and Eddie Collins) played in the World Series. Spitballer Red Faber- a rising star at the time- didn’t. Why? Because he’d been fighting the flu all season, leading to one of the worst campaigns of the first part of his career. By World Series time, he was done pitching for the year and instead focused on recovering. The next three seasons would see the recovered Faber have the three best years of his career. Hindsight, of course, is 20/20, but it’s hard to say that having a future Hall of Famer miss your World Series appearance would benefit your team. 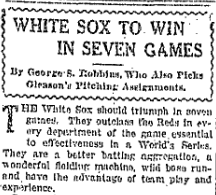 Interestingly, there is some belief that had Faber been healthy, there wouldn’t have been an attempt to throw the series in the first place, as it’s unlikely that he would have gone along with it and his playing would reduce the opportunities for “Black Sox” pitchers to affect the course of the series. 4. The Reds had a much better and deeper pitching staff. Defense, it is said, wins championships. In baseball, that means the pitching. And in almost every category, the Cincinnati Reds had a better pitching staff than the Chicago White Sox did. They had a better ERA, a better hits allowed/9, a better walks allowed/9 and a better WHIP, better Fielding-Independent Pitching. While the White Sox were better in some traditional statistics like strikeouts, when you look at deeper statistics, the Reds clearly had a better staff. They also had a deeper one. In an era where most pitchers went the entire game or close to it (thus giving the stat more meaning than it does now), the White Sox got 52.09% of their wins from the two pitchers who pitched the most innings for them: Eddie Cicotte and Lefty Williams. By comparison, the top two pitchers in IP for the Reds (Hod Eller and Dutch Reuther) accounted for only 39.58% of the Reds’ wins. The White Sox, without a healthy Faber, were for the most part essentially two aces carrying a staff, but the Reds were strong from top to bottom. Six pitchers on the Reds had at least 10 wins, and all but one of those six had lower ERAs than every single White Sox pitcher save for Cicotte. Obviously, home-field advantage is something that is of debated value, but the fact is… the Reds had it in this best-of-nine series. Despite this, most people thought the White Sox would win. Those are just samples. Now, to be sure, plenty of people picked the Reds. But more people seemed sure of the White Sox- both sportswriters of the day and the odds-makers. First off, the National League wasn’t really thought of all that well at the time. They hadn’t won a World Series since 1914, and had lost eight of the last nine. Many of the articles predicting a White Sox triumph more-or-less discounted the great record of the Reds due to the perception that they hadn’t faced as good of competition. Secondly, the White Sox probably were a better hitting team. They were ahead of the Reds in many categories, and the “eye test” generally favored them as well. Third, all of those fancy stats we have available now either weren’t available or weren’t embraced by people back in 1919. And finally, there is the case of big city bias. Chicago was and is a big market with large influence in politics, culture and media, and also had a much bigger population. That also meant more people would have seen the White Sox, and also more people would have been wanting to put some money down on the hometown team. The bookies would have adjusted the lines accordingly to make sure they’d come out ahead in the end. After all, what’s the use in fixing it if you are going to lose anyway? MR. OCTOBERS of 2015 WORLD SERIES GAME 5 and the MR. OCTOBERS of the 2015 POSTSEASON! The Mr. Octobers of last night were Matt Harvey (even though they lost) and Eric Hosmer. But who were the MR. OCTOBERS of the whole postseason? Look at the standings below and you’ll see they are Eric Hosmer and a tie between Wade Davis and Noah Syndergaard. I’d give the edge to Wade Davis, though, as a tiebreaker, since his team won it all. The MR. OCTOBERS of last night were Michael Conforto (even though the Mets lost) and Wade Davis.